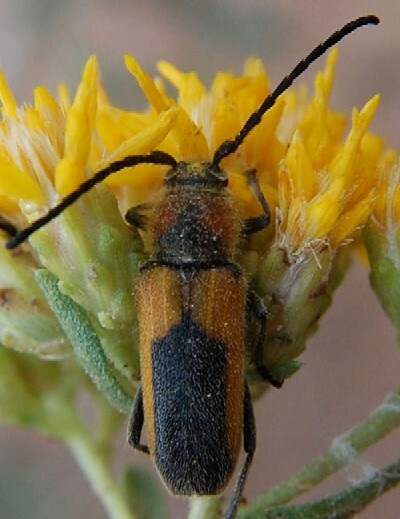 Like many of the colorful species of longhorn beetles, Crossidius is common on flowers by late summer and fall. In this case the beetle is feeding on nectar and pollen of Alkali Goldenbush (Isocoma acradenia) near Bumblebee, Arizona, Sept. 2008. Before this insect matured to be an adult beetle it was a worm-like grub that tunneled through woody stems or roots of a shrub. For a field biologist wanting to establish the host plant relationship the process can take many months if not years because this grub stage can last so long. The woody diet of the larva is not so nutritious with the result that the larval immature develops slowly. Dead or dying branches will usually contain a variety of beetle and other insect larvae. A biologist can collect these wood samples and keep them in a rearing chamber netted to prevent escape of emerging adults. Seems easy enough except for the long wait. The Sonoran Desert ecosystem has many such links that are little known to science and their importance to the overall system health can only be guessed. Crossidius pulchellus has been found to tunnel into the woody roots of Broom Snakeweed (Gutierrezia sarothrae) so it is possible that the species pictured here uses the roots of the related plant in the photograph, Alkali Goldenbush (Isocoma acradenia). Copyright Michael J. Plagens, page created 26 Nov. 2008.